I can remember the end of my senior year of college when I finally finished my very last required reading. It was such a great feeling - the knowledge that from then on out I only had to read things that I chose to read. Of course, at that time I didn't know that a year later I would go back to school for a Master's degree and later a teacher's certificate, both of which came with long, boring reading lists, but that's beside the point. For someone who loves to read, it was a very, very happy day! My all-time favorite time of the year to read is summer. Sure, the idea of curling up under a blanket with a good book and a hot drink on a cold, winter day sounds romantic and all, but honestly, give me a comfortable float in a pool with a warm breeze and an ice cold glass of something and I am in absolute heaven. Summer is in full swing now, and I have a brand new Kindle (an early birthday present from Bryn) loaded with books to read while I float in the pool...bliss! I just finished my first book and thought I'd share it since it was a good one. I was hesitant to pick this one up. There was so much hype surrounding The Fault in Our Stars that I figured I didn't want to get caught up in anything by the same author. [Side Note: I have not read The Fault in Our Stars yet because the whole plot just seemed depressing to me. I did watch the movie, and the story seems nice, but good God it's sad...but I will try the book eventually.] Don't ask me why because I do not have a good reason, but I had grouped John Green with Nicholas Sparks (you know, The Notebook?) I despise Nicholas Sparks' books and did not want to get mixed up with a similar author. Boy was I mistaken! 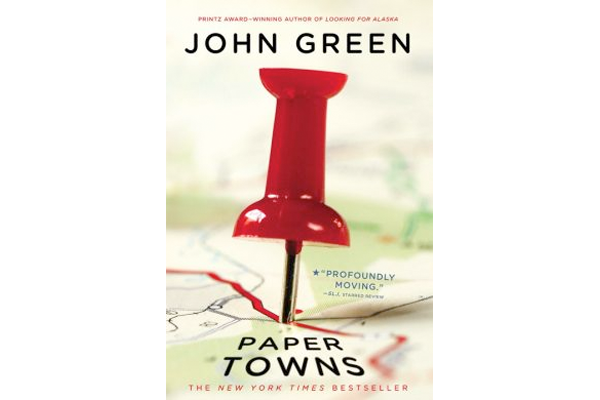 Paper Towns was one of those books that kept me up late because I just couldn't put it down. I found myself looking for any excuse to pick it up because it had sparked my curiosity. I love books that do that to you. It's a young adult novel (a genre that I really enjoy) so there is the occasional immature bit, but it's easy reading and very entertaining. This is one I would definitely recommend if you're looking for a good beach or pool-side (or couch or train or lunch break) read this summer. I'm about to start on The Vacationers by Emma Straub. I've read mixed reviews about it, but I've got an open mind and I'll be sure to let you know what I thought of it when I'm finished!